During the hot Irish summer of 1969, tensions rise in Belfast, where Katherine, a former actress, and George, a firefighter, struggle to keep buried secrets from destroying their marriage. In this emotionally acute debut novel, Michèle Forbes immerses the reader in a colourful tapestry of life. Throughout the book’s care­fully woven story, the bonds of family are tested and forgiveness is made possible through two parents’ indomitable love for their children. Ghost Moth was one of those books that I highly anticipated but was unfortunately let down by. I can't say exactly why it appealed so much to me though perhaps it was the intricate complexities of the lives within as well as the gorgeous cover art. The story made me feel like I was spinning my wheels a lot of the time. That is to say, like I was getting nowhere fast or rather that it was. The story seemed to lack depth in some areas whereas in others it was fully developed which led to a story that was unbalanced in many ways. Some of the characters were so realistic you couldn't help but root for them whereas others just left you wanting more and doubting their existence. It makes a story difficult to follow and get into when some characters are brought to life more than others and made it really difficult for me to keep reading at times, to be frank. 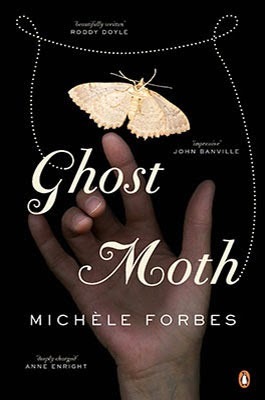 Ghost Moth was quite heartbreaking at times in many different ways whether it be in the personal lives or even in the current affairs of the country at that time. Yet there just seemed to be lacking something for me to really get into it and have that gut-wrenching feeling that means to me that it was a great novel. The story is worth reading if only for the historical content alone. I didn't love it and didn't hate it but definitely didn't regret reading it and hope that this promising writer will only get better and better.